Keisha Lindsay is an associate professor of gender and women’s studies and political science at the University of Wisconsin-Madison. 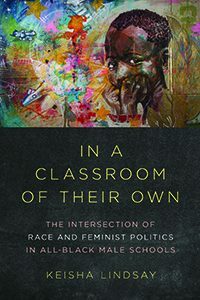 She recently answered some questions for us about her new book, In a Classroom of Their Own: The Intersection of Race and Feminist Politics in All-Black Male Schools. Q: What inspired you to study All-Black Male Schools (ABMSs)? My interest in studying these schools is both personal and professional. As one of the relatively few black women faculty members at the University of Wisconsin-Madison and as a former public school student, I am very much aware of the reality of systemic discrimination in the nation’s classrooms. So, when I heard about efforts to open an ABMS in Madison I was simultaneously relieved, disappointed, and intrigued. I was relieved because I felt the school board and white Madisonians were finally starting to listen to what local anti-racists have been saying for years – that something has to be done to address structural racism in the city’s schools. I was disappointed because the proposed solution, an ABMS, paid little attention to black girls’ significant experience of feminized racism in Madison’s public schools. Finally, I was intrigued because one of the key arguments in favor of ABMSs, in Madison and elsewhere, echoes an assumption that I encountered in my earlier research on “endangered” black men. This assumption is that black males underachieve not only because they are black in a racist society but also because they are black males who are forced to function in female-dominated, and consequently harmful, educational, occupational, and family environments. Q: In the book, you illuminate how the theory of intersectionality can be both liberatory and oppressive, revealing that it is a politically fluid framework. How do ABMSs both liberate and oppress students simultaneously? When I argue that ABMSs both liberate and oppress students I mean three things. On the one hand, the push to open these schools is incredibly liberating for black students because it helps to illuminate structural racism in the nation’s public schools. For instance, many of the most vocal proponents of these schools rightly highlight the fact that: 1) predominantly black urban schools are significantly underfunded relative to white, suburban ones; 2) the voices and experiences of black people are largely absent from school curricula; 3) white teachers discipline blacks students more harshly than other students; and 4) blacks are grossly under-represented in the nation’s teaching force. On the other hand, despite their best intentions, some supporters of ABMSs not only minimize the extent of black girls’ own academic underachievement but also reproduce deeply entrenched stereotypes of black girls and black women as “jezebels” who sexually distract and morally corrupt the males in their midst. Some of these same supporters also presume that women teachers are guilty of fostering “feminized” classrooms that encourage girls’ passive, verbal learning at the expense of boys’ more aggressive, testosterone driven learning styles. Part of the problem with this approach is that it mistakenly assumes, despite evidence to the contrary, that boys and girls have innate, biologically distinct ways of learning. Last but not least, my book reveals that supporters of ABMSs make these simultaneously liberating and oppressive arguments, in part, because they embrace the logic of intersectionality. Intersectionality is the analytical framework, pioneered by black feminists, that illuminates how race, gender, and other systems of power reinforce each other. The push to establish ABMSs is firm evidence that intersectionality can be used to advance many agendas including those that are simultaneously anti-racist and gender-biased. Q: How do supporters of ABMSs respond to your claims that ABMSs are inherently anti-feminist institutions, assuming that they have. If they have not, what responses do you anticipate receiving? I expect three responses. One response is that my research is tantamount to “colluding with the enemy.” Or that in highlighting the anti-feminist dimensions of the efforts to establish ABMSs, my book ultimately gives racist whites want they want – a way to thwart the growth of ABMSs and, in turn, black boys’ ability to achieve in school. The second, expected response is that we have to “rank order” black children’s educational needs. According to this argument, while it is true that some of the rhetoric in favor of these school ignores the depth and breadth of black girls’ own oppression in the classroom, the reality is that black boys are more oppressed than black girls. As such, their needs must and should be met before black girls’. Finally, I anticipate that supporters who are interested in collaborative and inclusive approaches to black children’s education will express a willingness to determine the best to ensure that all black children get the excellent schooling that they deserve. Put in more specific terms, I expect that these proponents will recognize that the rhetoric of some of their peers actually harms black boys as well as black girls. For example, claiming that “feminized” classrooms are necessarily a problem for black boys ignores black boys who don’t have “aggressive” learning styles and are, in fact, verbal learners. Furthermore, casting black girls as “jezebels” who sexually distract black boys from learning, ignores the social and educational needs of black boys who identify as gay and/or queer. Furthermore, I expect that the most open-minded supporters of ABMSs already recognize something else – that white supremacists have long used the idea of gender segregated schools to advance the troubling, two-fold notion that: 1) black people are racially inferior because we do not behave like “real” men and women and 2) that we consequently need to be segregated not only by race but also by gender so that we can be properly “schooled” in this regard. Q: In the book, you point out the shocking statistic that only 2% of US public school teachers are black men, while white women make up the majority of the nation’s public school teachers. How does this statistic contribute to the debate around ABMSs and masculinized racism, as well as public school reform more broadly? This statistic definitely contributes to the debate – and it should. That only 2% of the nation’s teachers are black men is unacceptable. Black students, including black boys, need to see far more teachers who look like them. Not only that, there is ample evidence that many of the white women teachers who make up the nation’s teaching force are racially biased against black boys. For instance, white women teachers are more likely than other teachers to discipline black boys and to presume that black boys are less intelligent than other students because they are black. Where many advocates of ABMSs go wrong is in assuming that white women teachers’ status as women or, more specifi­cally, as leaders of “overly” feminized classrooms necessarily contributes to black boys’ academic underachievement. This assumption ignores research findings which indicate that another group of women – black women teachers – actually have the highest, most positive expectations of black boys when compared with teachers of other social groups. In other words, the suggestion that women teachers necessarily harm black boys rests on a flawed, “biology is destiny” assumption which mistakenly presumes that to be a woman is, by definition, to fail black boys in the classroom. Q: You mention a number of binary oppositions involved in the theoretics of ABMSs, in the form of black versus white, male versus female, urban versus suburban, and poverty versus wealth. How do you think our society’s understanding of complicated social issues, such as education reform, is affected by seeing things in a framework of binary oppositions? There is no doubt that we live in a society in which generally assumes that social groups are either privileged or oppressed. We see this assumption among the many white women who assume that because they are oppressed as women they cannot exercise racist power over blacks and other non-white groups. This assumption is also at work when some black men declare that because they experience white supremacy they can never exercise gendered privilege over women. What this binary understanding of the social world means, in the context of ABMSs, is that many participants in the conversation about these schools have a deep desire to classify them as either “good” or “bad.” The more complex reality is that the effort to open separate schools for black boys is both “good” and “bad.” Indeed, as the logic of intersectionality teaches us – race, gender, class, and other arenas of difference are mutually reinforcing in ways that make it very difficult to categorize social groups – or for that matter social institutions and movements – as purely liberating or oppressive. ABMSs are no exception – they ultimately challenge and perpetuate racist, gendered, and other inequalities in America. Q: As an advocate for progressive and productive solutions to the problems facing US public schools today, what are your thoughts on the influx of public school teacher strikes that we have seen across the nation this year? Do you think the strikes speak to a larger issue in our nation’s public school system? I believe that the influx of public schoolteacher strikes speaks to the chronic underfunding of public schools in the name of neoliberal educational reform. These reform efforts presume that schools perform best not when they receive substantial government funding for teachers’ salaries and other expenses but, rather, when they are forced to “compete” in the marketplace for funding from corporations and other private entities. This privatization impetus is also one of the worrying issues regarding the push to ABMSs. I say this because while principals of some ABMSs recognize that fairly compensated, unionized teachers are ultimately key to successfully educating students, including black boys, other principals oppose teachers’ unions. Not surprisingly, there is evidence that teachers who work for this second group of principals often make far less that unionized teachers in traditional public schools.